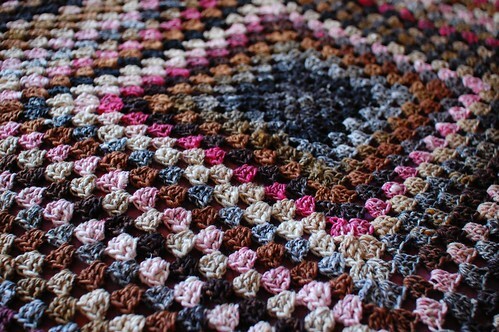 I’m extremely busy this week but I thought I’d pop by with some more photos of my giant granny square! This is all five balls of yarn that I had, and it’s about 42 inches square. 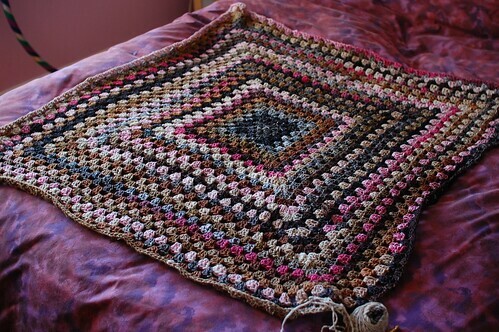 I still need to find something to crochet a row of border, and to do that whole fabric-backing thing. I love it though! Just in case anyone missed it, I used the Purl Bee granny square tutorial. Knitting? Yeppers, although just now I’m feeling a little stuck in terms of actually getting started on projects. I’ve got lots of ideas, I just need the time to sit down and work them out so I can get knitting! This is some Koigu that I really love – but this attempt got ripped. 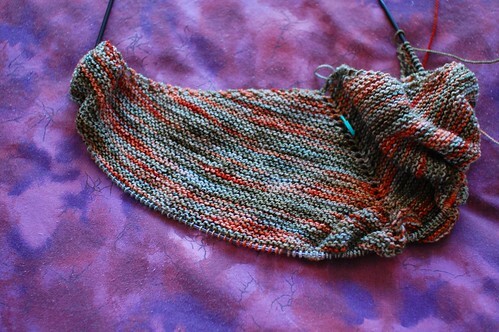 Working on something shawl-y. Spinning down the stash is going…okay. 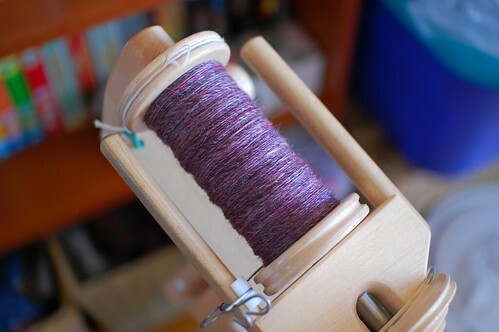 I’ve been working on some merino/silk – it’s probably Ashland Bay, and I got it at Rhinebeck last year. I’m almost done the second half, so then I can ply and be done with it! But I’m spinning it a touch finer, so of course it’s taking longer. Next bit I pull out of the fibre stash is getting the fast and furious treatment! I spy a Lendrum. I’ve recently purchased one and LOVE it! How do you like yours? Such pretty projects! I love that Koigu, and the yarn you’re spinning as well. 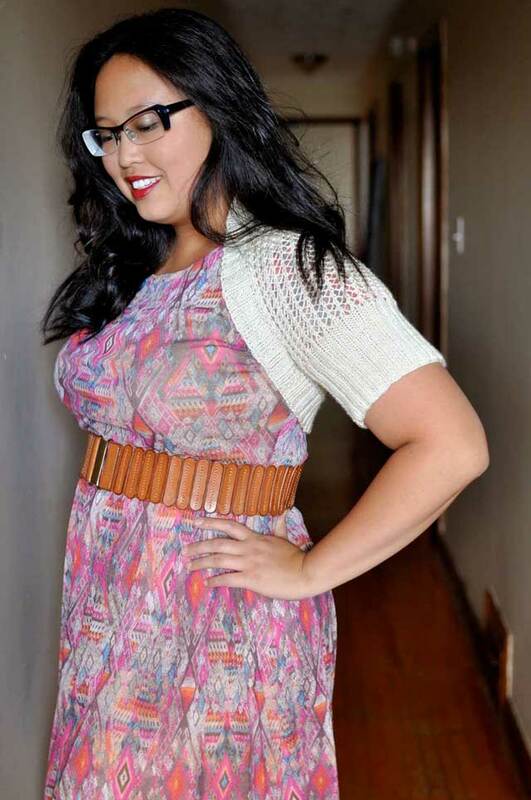 Granny squares are the building blocks to fashion. I love your big blankie! The colors are beautiful. What a cool blanket! The yarn makes it quite sophisticated. The giant granny square looks like a lot of fun! I just got the Noro I ordered for a giant square of my own and clicked over for the tutorial link. Thanks for the finished shots of yours–it’s gorgeous! I have 10 100 gram skeins of Iro, so I think mine will be a bit bigger when it’s done. Yours is such a wonderful inspiration! Oh, this is awesome! I’ve been trying to make my first Granny Square for the past week-and-a-half, and I finally got it!!! My goal? This blanket and the Babette! I can’t wait to get started! That blanket has such a beautiful colour palette – I love it! Love the granny square. It’s a wonderful color combination, similar colors to your spun yarn too. The granny square is looking great! wow! i can’t wait to see that granny square all complete! it’s a lot bigger than i thought it was!